I recently finished the amazing Libriomancer series with the amazing Revisionary (I think? Unless there’s a book five coming…?) 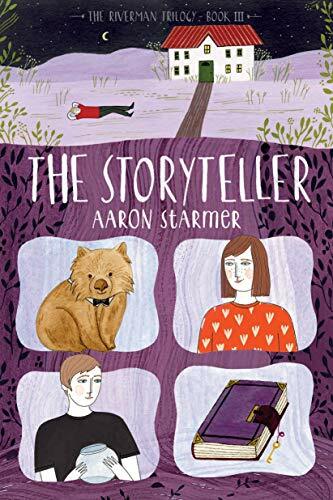 And I also recently finished the not so good Riverman Trilogy with the not so good The Storyteller. The Riverman by Aaron Starmer began the series very intriguingly, as Alistair hears from friend and crush Fiona about a magical world, and wonders if she’s actually covering some real world trauma. Book two, The Whisper, answers that question as Alistair dives into Aquavania himself, in pursuit of the Riverman, also called the Whisper, who has made Fiona and other kids disappear. The Storyteller brings us into the head of Alistair’s sister Keri, trying to make sense out of her brother’s reaction to a traumatic shooting and his strange stories, while also writing stories of her own. There’s an interesting concept at the core of this, that ideas from Aquavania leak out into the world and are picked up by people like Keri, to turn into stories. Story ideas do often feel like they must be coming from somewhere…though as I think about this more, in this scenario they’re just coming from the imagination of other kids, rather than the imagination of people actually writing them down, and as a writer-down of stories I’m not sure I like that after all! This may be a microcosm of why I didn’t like this series better. There’s a lot that makes me go, “hmm, that’s interesting…” but then it never comes together in a satisfying way. A lot of ethical questions come up in the second book, and even more mysteries about who is good, who is evil, what those concepts even mean, how the Riverman and Aquavania actually function and what Alistair’s role is…and this final book didn’t give me much of an answer to any of it. In many ways we moved right away from the center of the story. Keri is primarily an observer, and an observer who has a severely obstructed view considering she never sees or even really understands what’s going on in Aquavania. Keri never fully figures out what’s happening with Alistair, so the reader doesn’t either. Keri’s own stories are entertaining, but they have the kind of wild randomness you’d expect from a fourteen year old (a story about a glowing wombat, or a story where people use noodles as tubes to communicate across town…) It’s kind of cute, but there’s also an inherent problem as, well, there’s a reason people start writing stories with a little more logic to them as they grow older. But maybe this is a sign that I’m just too old for this book? There were cool things in this trilogy, although I was rocky about it at the end of book two. I really hoped book three would bring it together in a satisfying way, but it didn’t work for me. Someone less attached to logic and neat resolutions might like it much better, but it wasn’t the story for me. They both loved it, so that’s an alternate perspective for you…any other reviews?